Thank you to AirStone for providing all of the supplies that made this project possible. 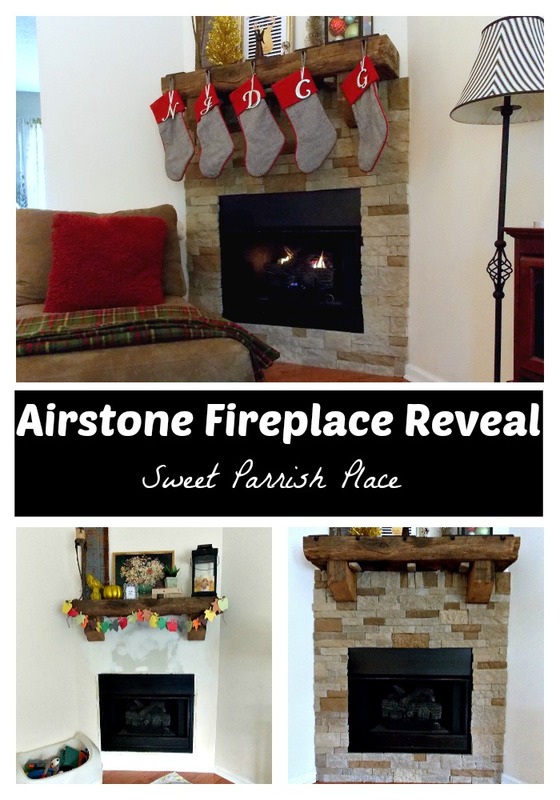 I have been looking forward to writing a post about my DIY AirStone fireplace reveal for over two years. And today is the day! I am so excited to show you what is one of my most trans formative DIY projects since I started this blog! My fireplace! We are over the moon in love with the way it turned out. I have a whole lot of pictures to share today of my fireplace, so be warned. This post is picture heavy, but I just couldn’t help myself. 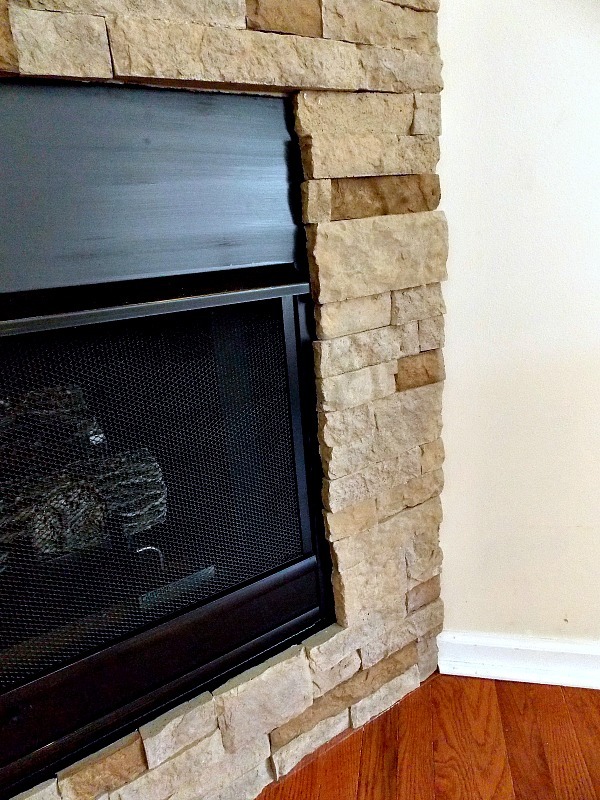 This post is a reveal of the finished product, but a full tutorial on how we installed this fireplace surround will be coming just as soon as I can get it written. 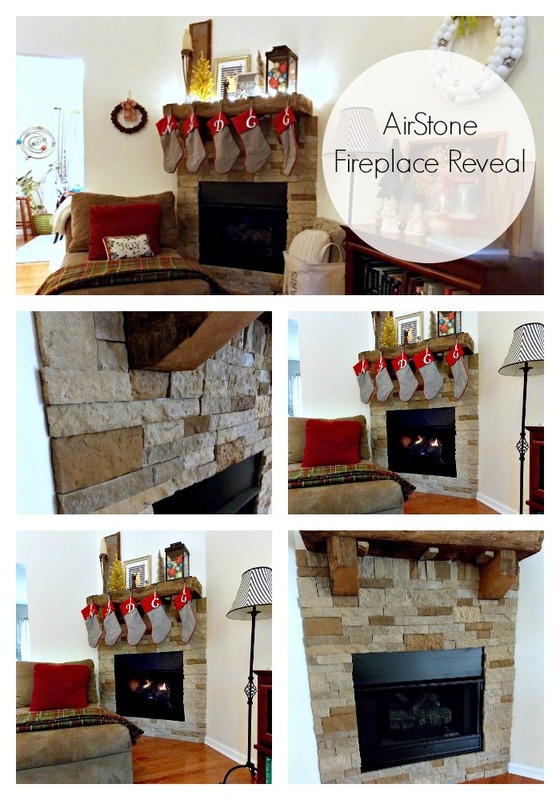 Several months ago, after researching several products to use as a surround for my fireplace, I decided that I wanted to use Airstone. 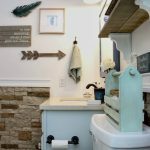 I contacted them with a proposal to collaborate with me on this DIY project, and I couldn’t have been happier when they said yes! 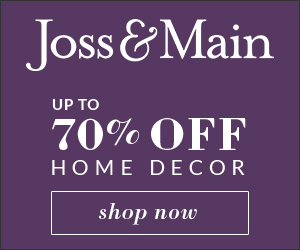 Seriously, the best thing that has happened as a result of my blogging journey so far! 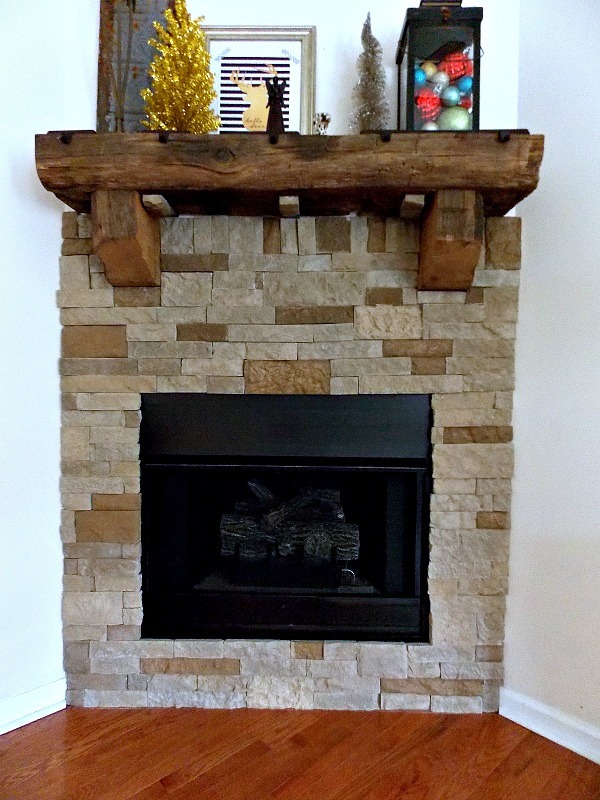 Here is a midway picture of our fireplace, after we installed the rustic barn beam mantle. It sat like this for a couple of months. 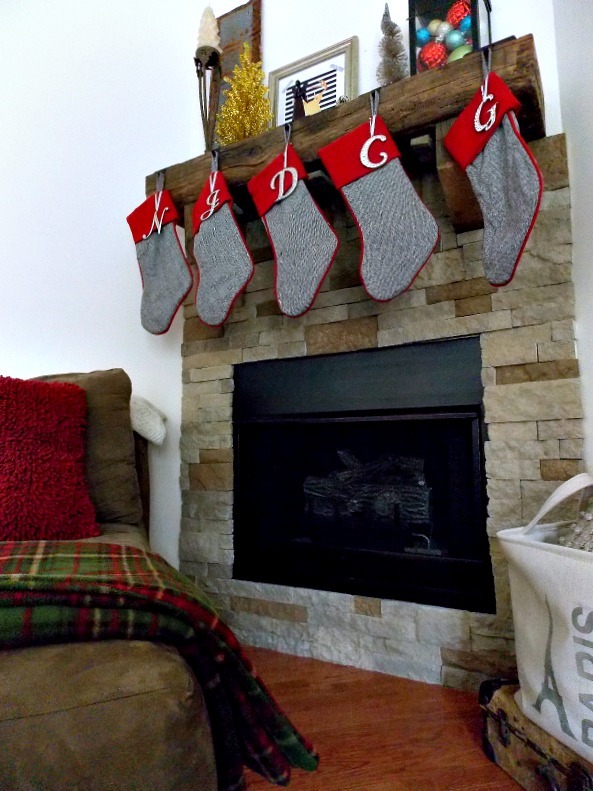 I actually edited out the patched up drywall in the reveal post of this mantle. Oh, the wonders of PicMonkey! And just to give you an idea of where we started with our fireplace, this is what it looked like when we bought the house. When I look back at this picture, which I shared in this post, I can really see how far I have come, both with my decor and my photography. And that makes me very happy! And BTW, the little dog is Bambi, and unfortunately we had to have her put to sleep about a year and 1/2 ago. So let’s move on to the reveal, shall we? AirStone comes in three different colors – Vineyard Blend, Spring Creek, and Autumn Mountain. The color we chose is Autumn Mountain. The actual gas insert did have shiny, icky brass detailing, and we painted it black. We only painted on one coat, and it needs a second. But we I had a little mishap and spilled THE ENTIRE CAN OF PAINT ON OUR KITCHEN FLOOR!!! It was not good people. And it happened 10 minutes before people started arriving at a party I was having. It was horrifying and unbelievable. But we were able to get the paint cleaned up, thankfully (although I am sure there is paint underneath of our stove. But we have not pulled it out and tried to clean it up yet. We are hoping paint thinner or something will get it cleaned up). So we need to get more paint and do a second coat. This surround took about two days to complete. But we did not spend the entire day either day working on it. All you need to cut the product is a hack saw. Mr. 14 Year Old and LC both helped me with the cutting. 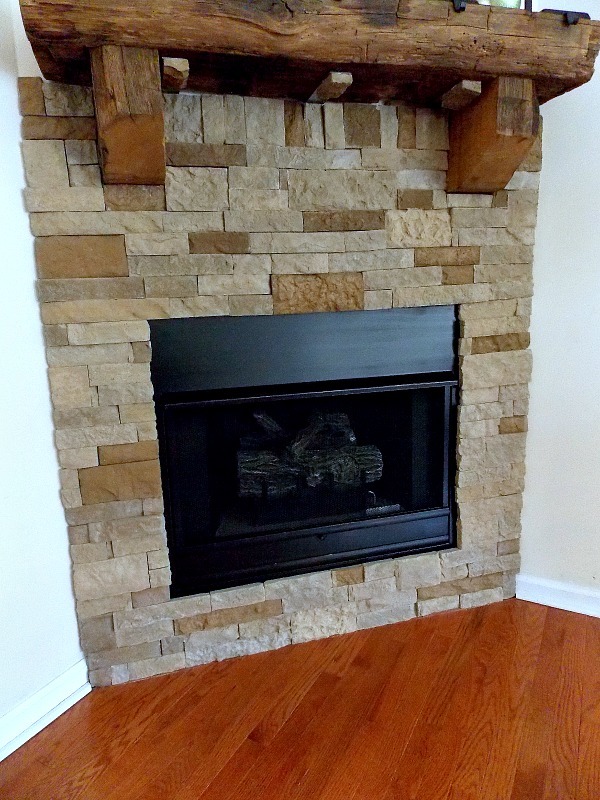 I removed the baseboard underneath of the fireplace so that we could bring the AirStone all the way down to the floor. We debated back and forth about it, but we are so glad that we made this decision now that it is all finished. I thought the whole process was kind of like putting a puzzle together. It comes in different shades, and you just vary the shades however you want. Fitting the stone in around the corbels and under the mantle was the trickiest part, and I will go into details about that when I write the tutorial. The Airstone comes in flat edged stones, natural edged stones, and corner edge stones. We did not need to sue corner edge stones. 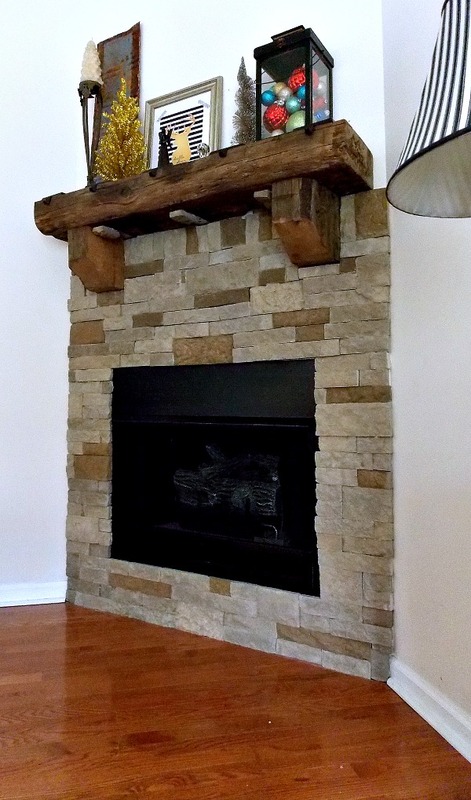 We used the natural edged stones to the right and left of the fireplace opening, and down the edges of the surround. 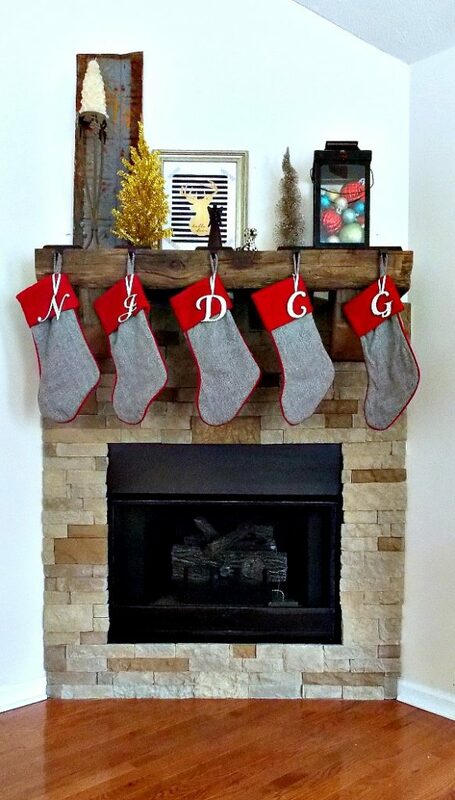 I could not decorate this beautiful mantle for Christmas fast enough! 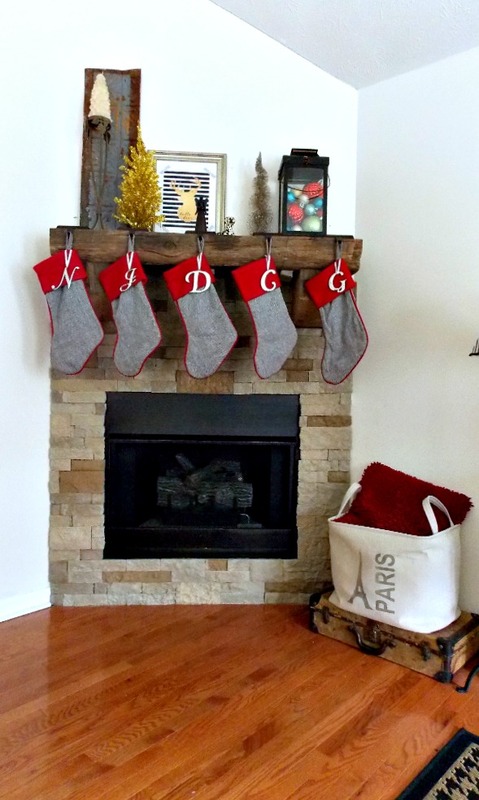 We have looked forward to the day that we had a fireplace just like this for so long, and I just love the way it looks all decorated for Christmas. 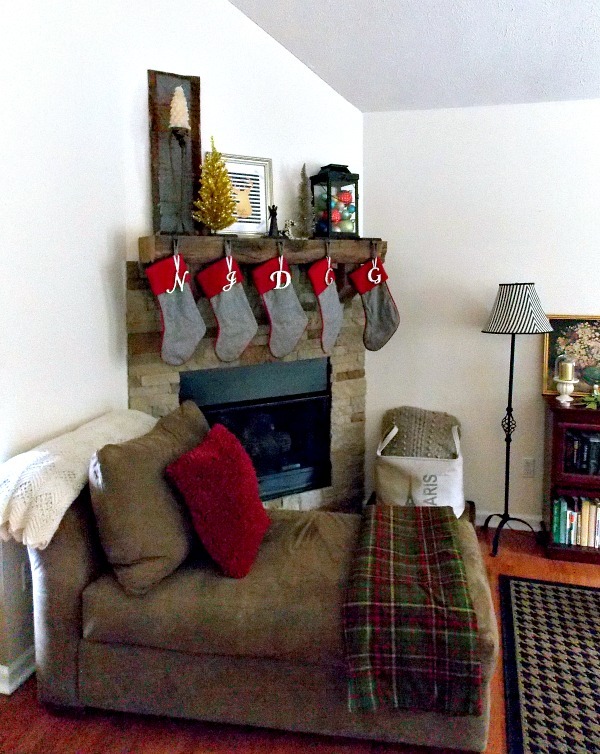 The beginning part of these pictures were the initial phases of the decorating process. I added a couple of more things later, and you will see them towards the bottom of the post. Another thing we did was to clean out the inside of the fireplace insert. I honestly don’t think it had ever been cleaned out. We took out the filthy dirty stones underneath of the logs, and we ordered some glowing embers to replace them with. However, they have not arrived yet. We also cleaned the actual logs. It made a HUGE difference, so I highly encourage you to clean out your gas fireplace every couple of years. 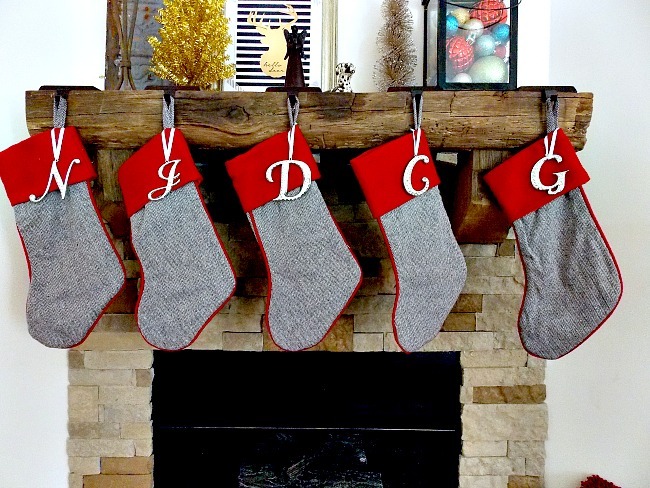 I bought these tweed and red stockings and the stocking hangers at Target on the day after Christmas last year. 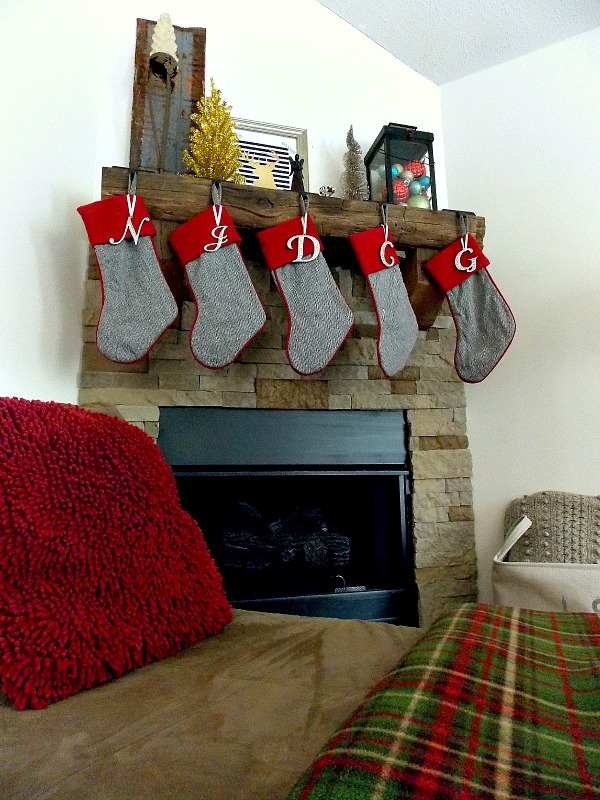 I just knew they would look perfect with my finished fireplace, and I think they do! Miss 18 Year Old helped me decorate the mantle, and I love the vibe. 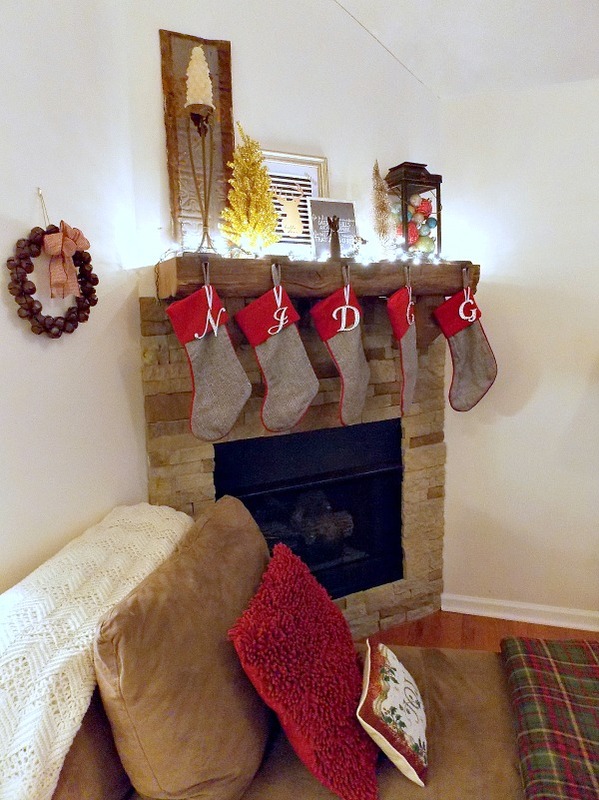 The gold foil tree could be considered tacky, but I love it with the mix of other things I have on the mantle. The chaise lounge is usually not in this spot, except each year at Christmas. We have to move it to make room for our Christmas tree. But it makes such a cozy place to sit next to the fire in the winter that I don’t mind it. 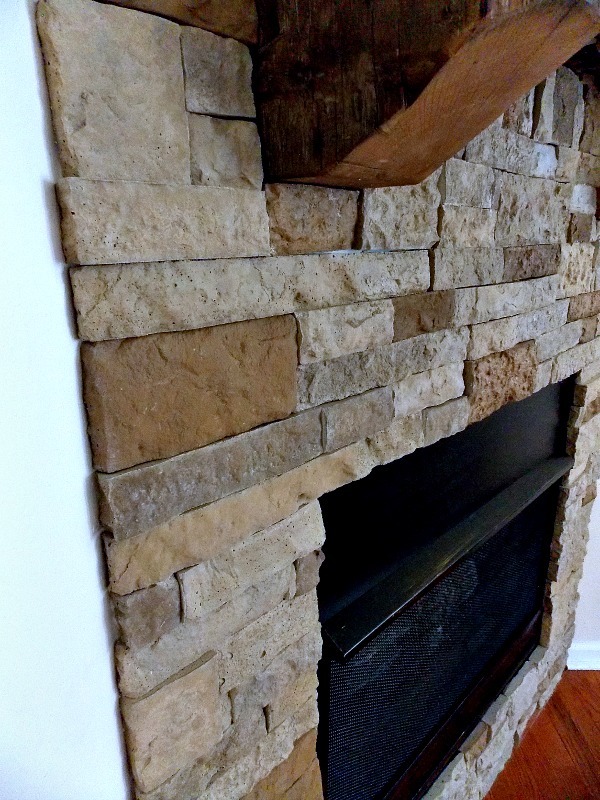 AirStone is a manufactured stone veneer that is comprised of 80% recycled materials. It is 75% lighter than real stone and 50% lighter than manufactured concrete stone. And the great thing about it is that it can be used both indoors and outdoors. I think it has both the look and feel of real stone. It is cool to the touch just like real stone. 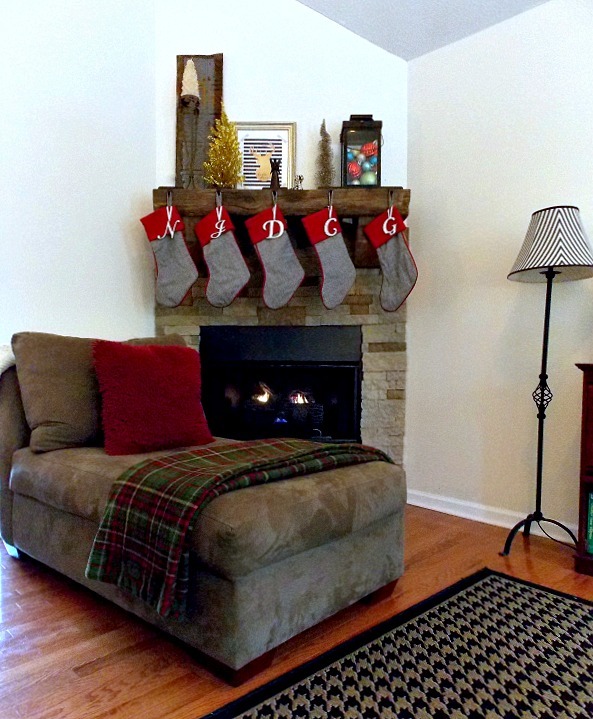 This fireplace transformation changed the whole look and feel of this room. Really, the entire upstairs! It is definitely the focal point of our living room now, instead of an eyesore. 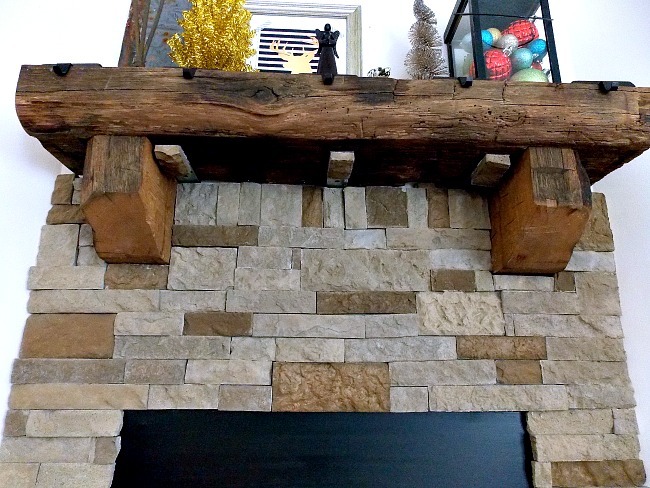 I LOVE the way the Airstone looks with the rustic barn beam mantle. It is exactly what I envisioned in my mind when I first moved into this house. I just love when that happens! When you come up the stairs and look to the left, this fireplace is the first thing you see. I used to be embarrassed about the way it looked. Now I am so proud to invite people over! I was lucky that I had 9 days off at Thanksgiving Break. We started on this project on Tuesday of Thanksgiving week, and it was finished in time to have our family over for Thanksgiving dinner. And if I do say so myself, the finished product was a huge hit with our guests! They all loved it, and they agreed that it looks and feels like real stone. 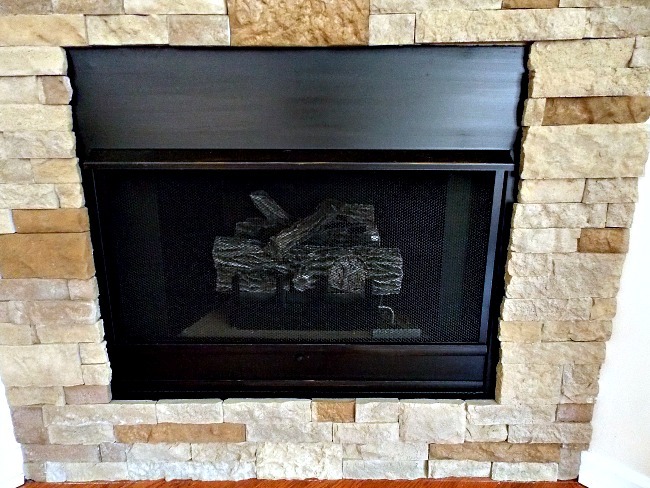 I am excited to get out glowing embers, I have read that they make a gas fireplace look much more realistic. I am sure I will sharing them on the blog once they are in! 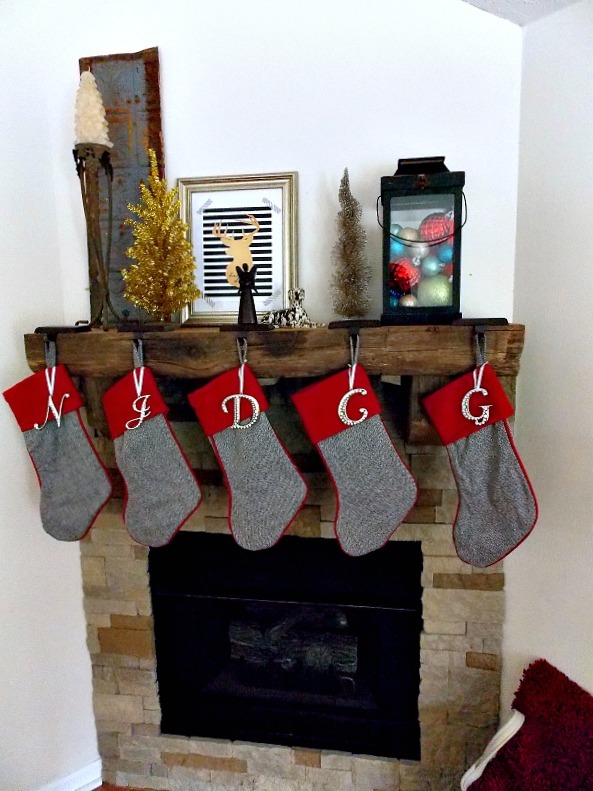 My house is all decorated for Christmas now, and I will be sharing it all with you this month. As you can see in the picture below, I added white lights to the mantle, and another print layered on top of the Deer Head. 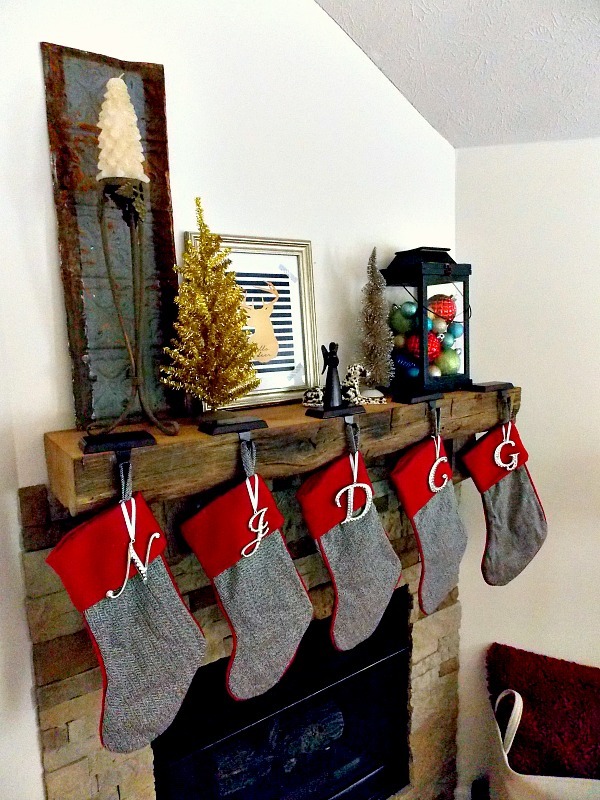 I will show you lots of up close pictures of the mantel decor in another post. I love the way it looks all lit up at night, and if you follow me on Instagram, you might have caught a picture I posted of it at night earlier this week. 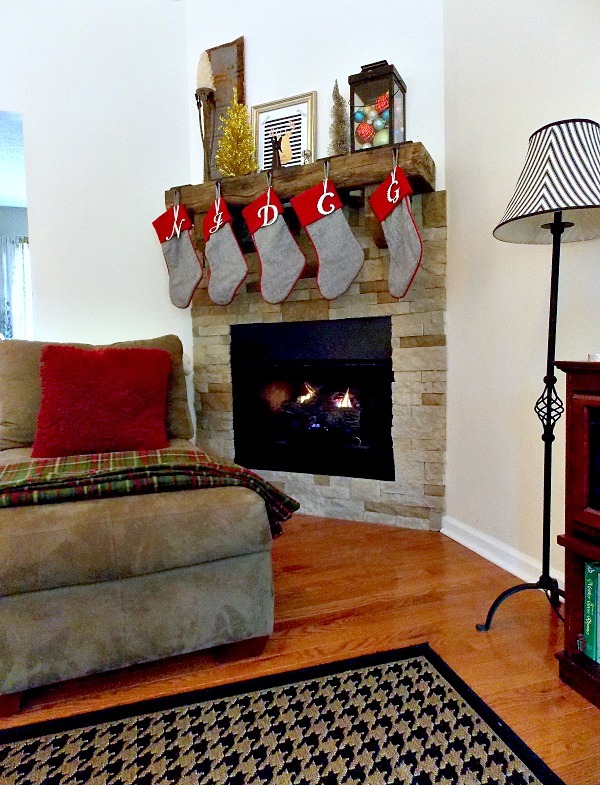 You can also see this mantle as soon as you exit any of the three upstairs bedrooms and head down the hall. And I can’t help but smile every time I walk out of our bedroom in the morning. I think I have logged quite a few hours of staring contentedly at this fireplace since it has been finished. I just love when you first finish a big project and you just can’t look at it enough times! I wish I could invite every single one of you over for a hot drink, and you could sit here and admire my fireplace together! This is not our forever home, and this is one thing I am going to hate to leave behind when we do move. 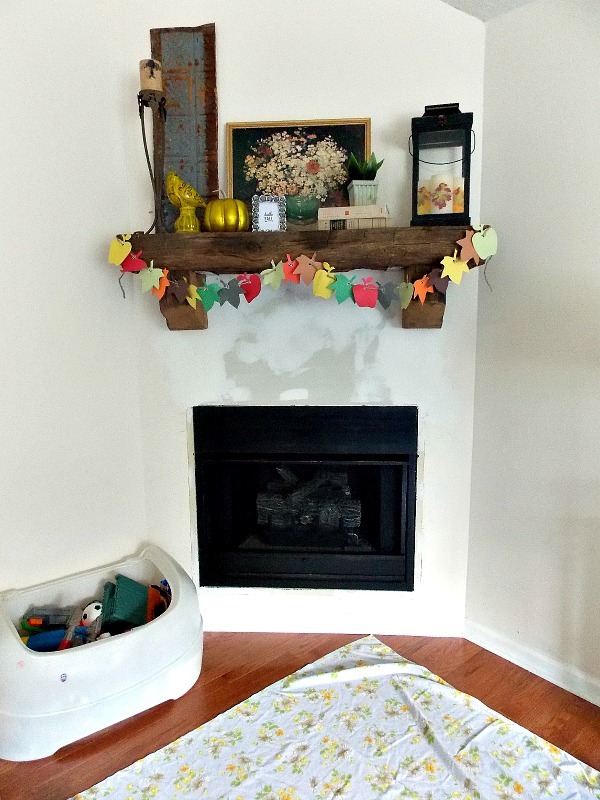 But one thing is for sure, I think that when the house goes for sale (which is a few years down the road) it will be a big selling point that this fireplace is complete, no longer just a box in the wall. And that makes me very happy! 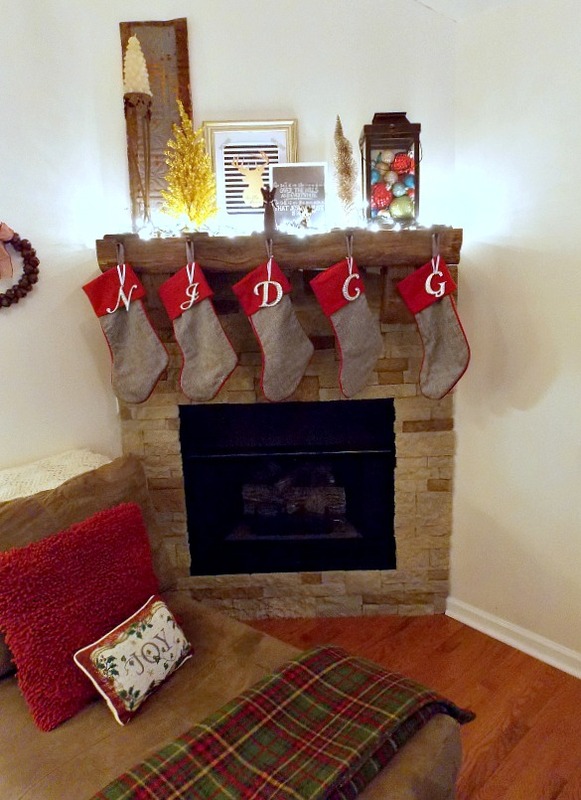 Thank you so much for stopping by and seeing our fireplace reveal today! I hope you enjoyed reading about it as much as I enjoyed showing it to you. 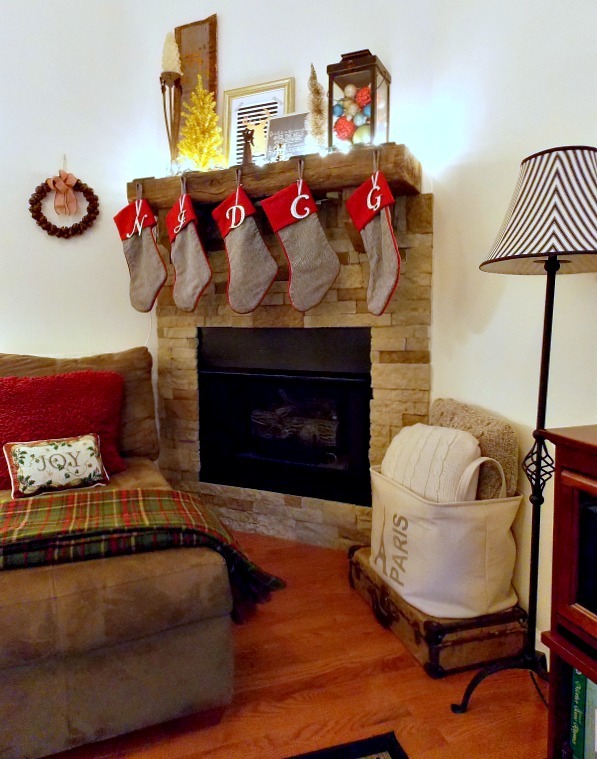 And don’t forget to come back to read the tutorial about how we installed our AirStone fireplace surround. I am hoping to have it ready next week or the week after. 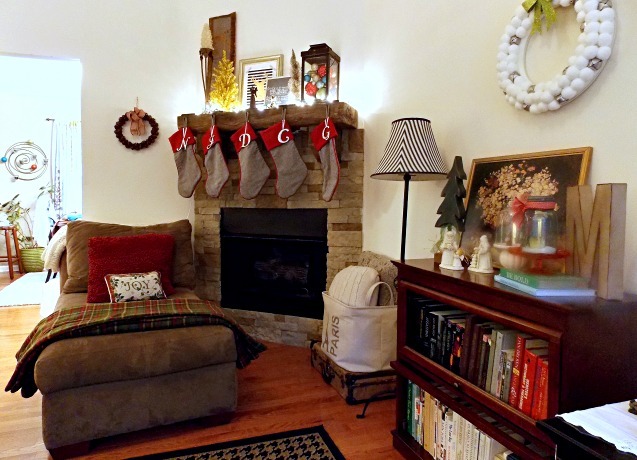 And I will also be sharing the entire living room all decorated for Christmas very soon too. 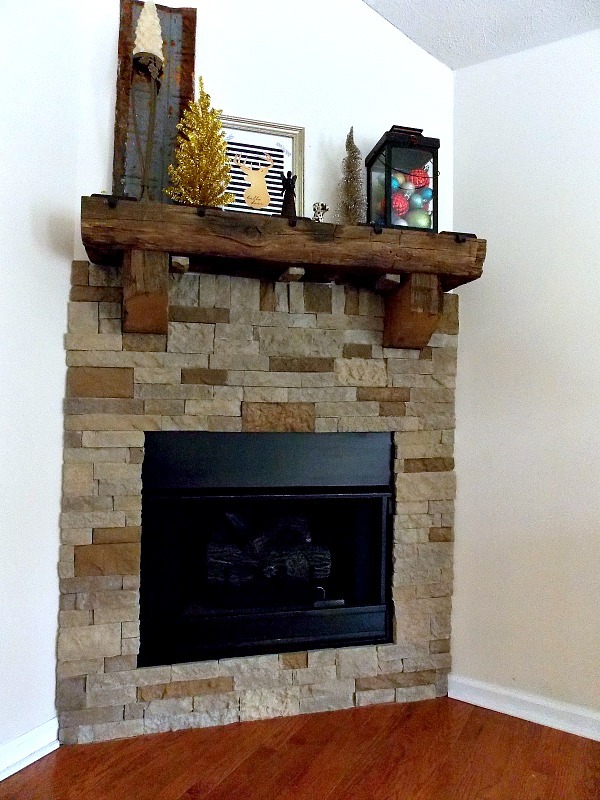 Update: To see a full tutorial about how to install an AirStone Fireplace surround, click here.